This post will go over command handling with Discord.Net. Whether you are following along from the Raspberry Pi series, or are just curious about how to do command handling with Discord.Net, welcome! If you want to follow along with the finished code, go here: https://github.com/gngrninja/csharpi/tree/02-command-basics. If you would like the starter code, and want to try building off of it yourself, go here: https://github.com/gngrninja/csharpi/tree/intro. The first thing we’ll want to do is add the command handling service. The first thing we want to do here is create the command handling service. 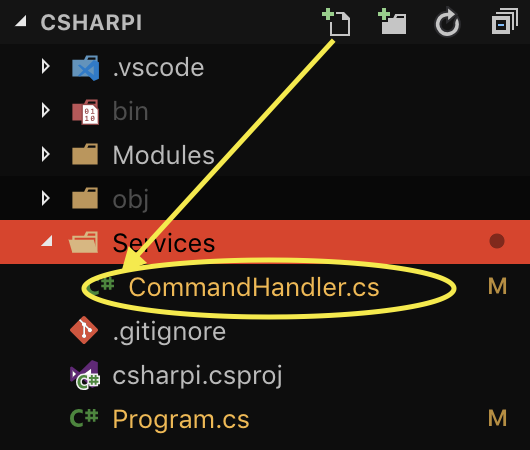 Create a folder named Services, and under that folder a file named CommandHandler.cs. You can always view the most updated code, here: https://github.com/gngrninja/csharpi/blob/02-command-basics/Services/CommandHandler.cs. // register modules that are public and inherit ModuleBase<T>. The above code will parse out the command prefix from the configuration file config.json. You can replace the “;” with whatever one-character prefix you’d like to use. Now what we have created our CommandHandler service, let’s wire up Program.cs to enable dependency injection and use it. Next we’ll want to modify Program.cs to add dependency injection. // the config we build is also added, which comes in handy for setting the command prefix! Now that we’re wired up to use dependency injection, and have our service created to handle commands, let’s create our first set of commands (the right way!). In this section we will be writing our first real, robust commands. Writing commands this way gives us access to Discord.Net’s command writing goodness. 1. 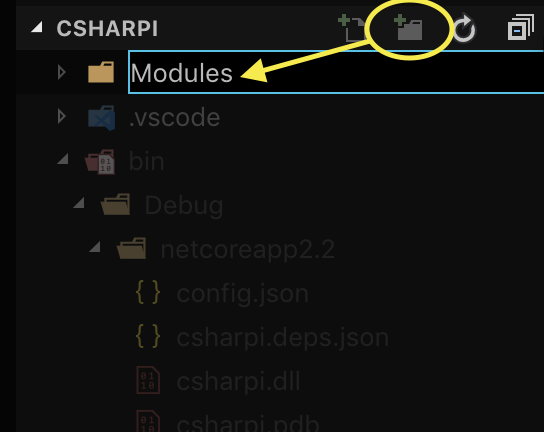 Create a folder named Modules, and under that folder a file named ExampleCommands.cs. ExampleCommands will contain our first commands using this framework! // let's use an embed for this one! // if we have a question, let's give an answer! That’s it! Now we’re ready to debug/test to see if it is all working! Remember it is F5 in VS Code, or you can use [Debug] -> [Start Debugging] from the menu bar. The text in quotes is what the command name is and what the user will use to trigger the method. There are other attributes that can be added, more on those in the 8-ball example. The code above is what executes when the bot code finds a match for the “hello” command. To get this working on our Raspberry Pi we will simply need to push the updated code to the Github repo, and pull it down to the Pi. We will need to update our config.json on the Pi, and copy it to the debug folder, as well as the bot folder (after we’ve added the Prefix line). If you’d like more information on getting the initial setup done with the Raspberry Pi, visit the below post and check out it’s prerequisites as well! The below steps all assume we are sshed into our Pi. If you are following along, and want to use my Github repo as reference, you must ensure you’re working with the proper branch for this post. You can see here we are in the intro branch, and we need to switch it up! Now that we have the latest code on the Pi (refresher here if you’re using your own repo), let’s edit the config.json file to add the command prefix we want to use. Success! Now to get it published and run it properly. Looks good, but one more test with Discord to really be sure! Looks like we’re all set. In this post we added some proper command handling to our Discord bot. Feel free to change things around and see what you can make happen (or break and fix… break + fix = learn, right?). In the next part of this series, we will add proper logging to the bot. If you have any questions or comments, leave them below!